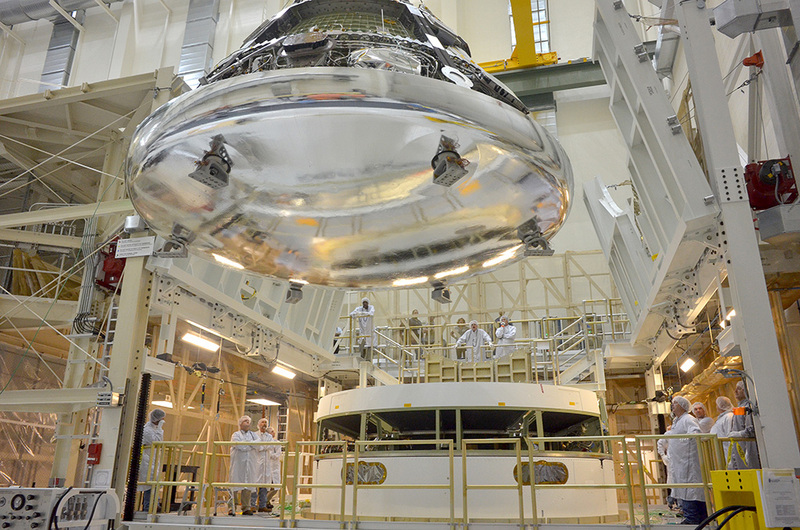 With just six months until its first trip to space, NASA’s Orion spacecraft continues taking shape at the agency’s Kennedy Space Center in Florida. Engineers began stacking the crew module on top of the completed service module Monday, the first step in moving the three primary Orion elements –crew module, service module and launch abort system – into the correct configuration for launch. With the crew module now in place, the engineers will secure it and make the necessary power connections between to the service module over the course of the week. Once the bolts and fluid connector between the modules are in place, the stacked spacecraft will undergo electrical, avionic and radio frequency tests. The modules are being put together in the Final Assembly and System Testing (FAST) Cell in the Operations and Checkout Facility at Kennedy. Here, the integrated modules will be put through their final system tests prior to rolling out of the facility for integration with the United Launch Alliance Delta IV Heavy rocket that will send it on its mission. Orion is being prepared for its first launch later this year, an uncrewed flight that will take it 3,600 miles above Earth, in a 4.5 hour mission to test the systems critical for future human missions to deep space. After two orbits, Orion will reenter Earth’s atmosphere at almost 20,000 miles per hour before its parachute system deploys to slow the spacecraft for a splashdown in the Pacific Ocean. Orion’s flight test also will provide important data for the agency’s Space Launch System (SLS) rocket and ocean recovery of Orion. Engineers at NASA’s Marshall Space Flight Center in Huntsville, Alabama, have built an advanced adapter to connect Orion to the Delta IV Heavy rocket that will launch the spacecraft during the December test. The adapter also will be used during future SLS missions. NASA’s Ground Systems Development and Operations Program, based at Kennedy, will recover the Orion crew module with the U.S. Navy after its splashdown in the Pacific Ocean.